Noah's Ark and Mt Ararat - found not in Turkey, but in Iran? Noah’s Ark was claimed to be found in Northern Iran rather than Turkey. Over a thousand expeditions had previously scoured Turkey’s Mt. Ararat, but by following the precise language of the Bible, Cornuke found what is believed to be Noah’s Ark, nearly in tact. Turkey’s Mt. Ararat was incorrect because Marco Polo named the large mountain during his journeys in the 13th century. 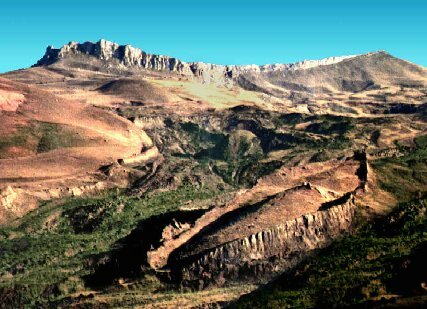 Through mapping scriptures in Genesis with ancient maps, Cornuke pieced together the clues and found where the Ararat Mountain Range made home for Noah’s Ark in Northern Iran not far from Turkey. Bob Cornuke has been at the center of several controversies over his past findings as he has come at odds with secular scholars, but several people who I know personally were on this expedition as well as some credible, internationally known heads of Christian ministries. Cornuke and the participants are careful to not say emphatically that they found Noah’s Ark, but have taken extensive documentation to present their facts for both the public, and the Biblical and scientific communities. After crawling on hands and knees miles above the earth’s surface in four below zero weather, the expedition found an altar, which could very well be the altar Noah built because it was made from the same materials they later found in the Ark. They found grapevines over two inches think in the area, of which the DNA from the grapes is the oldest known to man. Genesis 9:20 says that Noah planted a vineyard. But most amazing was the ark itself. It was found in sections, somewhat like a house that had collapsed over the years. Sections of petrified wood 12 to 14 feet high and 40 feet long were found. They found a huge pile of timber, thought to be floors or walls, in four-to-six foot sections. Geologists took nine samples of the ark under the strict eye of a video team for analysis by the Smithsonian Institute. Over 23,000 feet of video was taken and will be released to the public. You can get your first glimpse of it on Fox News with John Kasich Saturday at 8:00pm Eastern time, according to the Cornuke team. The expedition members hope to spark debate over the Ark; hope to show that the Bible is accurate and true; and hope that people will come to know Christ through the truth that they have revealed. In John 8:32, Jesus said, “And you shall know the truth and the truth shall make you free.” May you be revived and energized by the possibility of this wonderful discovery that there is one God and His truth reigns forever. Is this the real Noah's Ark? Why is more of the wood not fossilized? Because it was covered in pitch? Local weather conditions? Why didn't Ron Wyatt give pieces of the wood to others to be tested other than that one lab? Why didn't the lab report state what kind of wood it was made of? Was it gopher wood, or not? If not real the real Noah's Ark, then why is it there? This was held for years in a confidential file labeled "Ararat Anomaly." The worldwide Flood in the time of Noah is no fable! According to Scripture, God destroyed the ungodly who then lived on the earth. It is probable that this ungodly people included giants who were born from the unholy union of the descendents of Adam and the fallen angels. This probably created a gene pool which resulted in our short live spans, cancer, heart disease, etc. All archeological evidence supports the biblical account that a worldwide flood did happen. Countless fossilized sea creatures have been found on mountain tops. And countless fossilized creatures (including dinosaurs) have been found with food in their mouths --as if they were suddenly buried in an avalanche of rushing water and mud. That's not all. Accounts of the worldwide flood come in from nearly every culture on earth. Most of these are identical. Flood accounts come in from Mayan, Persian, Aztec, Sanskrit, Chinese, Egyptian, Babylonian, Inca, Samarian, American Indian, Jewish cultures, and more. The Mayan writings say that water cleansed the earth in 3113 B.C. Located in glacial ice at an altitude of 15,300 feet in 2003, some scientists say the photo suggest its length-to-width ratio is close to 6:1, similar to the description in the Book of Genesis. Same anomaly as the 1949 image above. Satellite image of 'Ararat Anomaly,' taken by DigitalGlobe's QuickBird Satellite in 2003. The anomaly remains ensconced in glacial ice at an altitude of 15,300 feet, and Porcher Taylor a past Washington intelligence analyst says the photos suggest its length-to-width ratio is close to 6:1, as indicated in the Book of Genesis. While it's quite possible the item of interest could simply be a natural ridge of rock, snow and ice, Taylor says there's also a chance it could be something manmade. "I had no preconceived notions or agendas when I began this in 1993 as to what I was looking for," he said. "I maintain that if it is the remains of something manmade and potentially nautical, then it's potentially something of biblical proportions." Ray Anderson just sent me the link to his brand new site detailing his own search for Noah's Ark on Mount Ararat. His new site has pictures and sighting reports I had never before heard of. Can it be that God has purposely kept Noah's Ark hidden till the right time in these "End Days", when all those who are written in the "Lamb's Book" are converted by Faith in Jesus, and NOT by an object such as Noah's Ark? When you look at the region surrounding Ararat don't necessarily believe, after dozens of earthquakes and thousands of years, you see what Noah saw. Would the Lord hang the Ark on the side of a cliff, where Noah would need Longshoremen to rig the mountain side with netting, block and tackle in order to get the animals down? I don't think so. I believe Ron Wyatt has latched on to something here. It's long but if your interested. Boat-like form is seen near Ararat!! While routinely examining aerial photos of his country, a Turkish army captain suddenly gasped. There, on a mountain 20 miles south of Mt. Ararat, the biblical landfall of Noah's Ark, was a boat-shaped form about 500 feet long. The captain passed on the word. Soon an expedition including American scientists set out for the site. At 7,000 feet, in the midst of crevasses and landslide debris, the explorers found a clear, grassy area shaped like a ship and rimmed with steep, packed-earth sides. Its dimensions are close to those given in Genesis: 'The length of the ark shall be 300 cubits, the breadth of it 50 cubits, and the height of it 30 cubits,' that is, 45Ox75x45 feet. A quick two-day survey revealed no sign that the object was man made. Yet a scientist in the group says nothing in nature could create such a symmetrical shape. A thorough excavation may be made another year to solve the mystery." At that time, Ron determined that one day, he would visit the site and see for himself. But that was a dream he could scarcely realize any time soon. He had a 1 year 4 month old daughter, a 3-month-old son, and within a year and a month, he would have another son. Working as a lab technician in the quality control lab at Hercules Powder Plant in Kalamazoo, Michigan, he was also attending Western Michigan University, studying pre-med. But soon, family matters forced him to give up his hopes of becoming a doctor and he moved to Kentucky in 1964 where he entered nursing school. He graduated in 1967, entered Anesthesia School and graduated as a Certified Registered Nurse Anesthetist in 1970. It was also in 1970 that he found himself raising his 3 young children alone. It didn't look like there would ever be any opportunity for him to visit the strange boat-shaped site, so he had to limit his archaeological research to libraries and bookstores. But he never lost interest— in fact, he studied everything concerning ancient history and archaeology, not just subjects concerning Noah's Ark. He had found that there was very little information available on the subject of Noah's Ark, which convinced Ron more than ever that no serious research had ever been undertaken on the subject. Everything he had read was based on folklore and unsubstantiated claims, and all claimed sightings were in different locations. From 1973 to 1975, he and the children lived in Hawaii, where he was able to study volcanoes first hand. This convinced him that if the ark had landed on the volcanic peak called Mt. Ararat, that it would have long ago been destroyed. Despite the fact that there are those who have written elaborate explanations of how the ark could have survived on the volcanic peak, within a few years, the eruption of Mount St. Helens would soon show that NOTHING could survive on a volcanic mountain such as Ararat. If the ark had ever been there, he concluded it would have long ago been destroyed. Moving back to the mainland in 1975, he decided that there was one form of research that he could do— he built a small boat model the same ratio as the ark as stated in the Bible, and then he built various "mountain" configurations in a stream. By floating the model down the stream, he observed the boat's reaction as it approached the various shaped "mountains". What he learned was that when the boat approached a simple peak extending out of the water, it simply floated around it, not approaching it or certainly not landing on it. This was the "lateral displacement" of obstructed gas or liquid flow. He continued this experiment with several shapes with the same result each time. That is, until he built a "crescent-shaped " formation with the crescent facing down-flow. 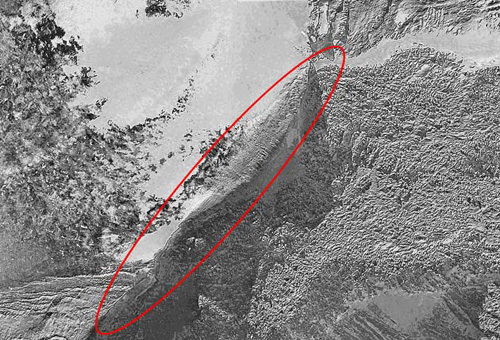 When the boat accelerated around this "crescent-shape" mountain, he saw that it was pulled into the area within the crescent by the "eddy" effect, where it then gently floated within that area. With this bit of information, Ron felt like the ark would have had to have landed on such a location. The laws of hydrodynamics and water action and reaction were the same then and now. If the ark had approached a mountain peak extending out of the water, the water displacement around the mountain would have carried the ark with it. The study of water as a fluid, with its unique properties, and the study of hydrodynamics (fluid mechanics) and wave causation and motion is a most involved and complicated science. The actions and reactions of water and an object floating on that water cannot possibly be studied in depth here— but some simple rules must be understood. If your ship on the open sea approaches a mountain extending out of the ocean, only one of 2 things can happen. One, the ship will be carried around the mountain with the lateral water displacement. Or, two, the waves can be of such force and direction that they carry the ship right into the side of the mountain, with such force that the ship would break into pieces. But it would NOT come to rest on that steep mountain side. It just wouldn't happen. And if that mountain peak were directly under the ship and the waters slowly descended, the ship-STILL wouldn't land on the mountain side (such as on Mt. Ararat). The water displacement and movement around the underwater mountain would still cause the ship to be removed from the mass (of the mountain) with the water. The necessary criteria for a ship to land on a Mountainside as sea waters descend would involve a process by which the water displacement would trap the ship within an area, such as an eddy could do. At least, that's what Ron believed and still believes. One of Ron's favorite subjects of study was the ancient Egyptians as related to the Biblical account. While in Hawaii, he had read everything he could get his hands on in the library. And as he mulled all the information over in his mind, there was one thing that seemed to be obvious to him: He knew that Moses had been the author of the Genesis account and therefore the flood story- and as such, Ron believed that the cubit Moses would have known would have been the Royal Egyptian Cubit, the most universal standard of measurement in the ancient world at that time. There was no "Hebrew cubit" in existence during Moses' time, and to Ron, the 500 foot measurement given in the "Life" article was even more compelling evidence that the site needed thorough exploration. After all, 300 Royal Egyptian Cubits equals 515 feet, not the 450 feet commonly accepted (and based on the future Hebrew cubit). 1975 - "The Ark File"
It had now been 15 years since he had read that article, but his interest never waned— it only grew. And then he read the book, "The Ark File" by Rene Noorbergen who just happened to be a member of that 1960 expedition to the boat shaped formation. Until this time, Ron had no more information on the boat-shaped object other than what he had read in "Life" Magazine, but now he knew the names of the very men who visited it. So, he contacted all but one of the American members of the expedition and asked them everything they could tell him. When he told them he wanted to visit the site, they all basically told him he was crazy to do so. They were all adamant that nothing was there— that is, all except one man, Dr. Arthur Brandenburger, who still believed it was a ship. He asked them how to got to the site—after all, "20 miles south of Mt. Ararat" is a pretty vague location in a region that is all mountains. But, no one could tell him exactly how to get there because they had ridden on horseback for hours to the site, being led by the Turkish military. 1977 - Time to Go to Turkey! In 1977, for the first time, Ron felt like his children were old enough for him to either leave them alone at home or take them with him to Turkey. For the first time, he had 2 weeks of vacation. And for the first time, he had enough money to go to Turkey. It was now 17 years since he first read about the site. So, he told the children what he was about to do and to his dismay, the boys, Danny who had just turned 17, and Ronny who would be 16 in 2 months, insisted on going too. Torn about whether to take them or not, he did the only thing he knew to do— he said a little prayer that if the boys were supposed to go, that they would receive their passports in time, AND, that there would be seats available on the chartered flight to Istanbul from New York. He had been told that he had booked the last seat on the flight and when he called to check on availability, he was again told that none were available. It was now within a week of his departure date. But 2 days later, he received a call from the airline— it seemed that 2 seats had come open at the last minute and did he want them? There was still the matter of the boys getting their passports, a procedure which usually took several weeks. But in 3 days, Danny's was back. And the next day, Ronny's arrived. "Yes," he wanted the seats. On August 9, 1977, they arrived in Istanbul. Things were a lot different then, than they are today— they had to take a bus to Ankara, and then a train to Erzurum. This consumed 3 valuable days and they were still not in Dogubeyazit, the little town near the site. In Erzurum, they took a taxi to Dogubeyazit, directing their driver to take them to a hotel there. But Eastern Turkey is no thriving tourist area. It is remote and dangerous. Very few people speak English. How would they ever find the boat-shaped object when they got there? Many people may find Ron's method of getting information strange, but again he did the only thing he knew to do— he prayed about it. He told the boys to say a prayer that the taxi would stall at the place where they were to begin looking. After all, their taxi driver spoke no English, they didn't know if anyone in the town would speak English—and even if they did, would anyone know where this boat-shaped object was? It had been 17 years since the expedition had come there, perhaps the townspeople had forgotten all about it. So, they all prayed— not some great elaborate prayer, but just short, silent prayers for help. To Ron's way of thinking, if Noah's Ark was real, then the rest of the Bible was surely just as reliable, including everything said about prayer. And as they approached the town, the taxi stalled. Full of excitement at seeing their prayers answered, they all three climbed out of the taxi and piled a great number of rocks on the side of the road while the bewildered driver peered under his hood. When they all got back in the taxi, it started up and they continued on down the road. Soon, it stalled again. With a little bit less enthusiasm, they again piled up rocks on the roadside. Again, the taxi started up when they all got back in. Finally, it stalled again, and thinking that perhaps they had just gotten a defective taxi, they each placed one rock in a pile on the side of the road. This done, they headed to the hotel. It was late when they arrived and as soon as they checked into the Erzurum Hotel in Dogubeyazit, they all fell asleep, completely exhausted from their long journey. The next morning, they got another taxi and headed back to the third and closest pile of rocks, where they began walking in a perpendicular line from the road. They soon came to a small village where several very intimidating men approached them, one with a shotgun. Communicating in "sign language," Ron convinced the men that they were just tourists, and the villagers appointed themselves their tour guides. Walking over miles and miles of rugged terrain, one of the men motioned for Ron to take his photo by a very large standing rock. Only when he looked through the viewfinder did Ron realize that this "rock" was identical to the anchor stones found in the Mediterranean Sea that he had seen in archaeological books. That is except for one thing— this "rock" was many, many times larger. When he examined it more closely, he saw that it had 8 crosses carved on it. When the villagers saw Ron's interest in this, they showed him several more in the area—all exactly like other ancient anchor stones except many, many times larger— and all with crosses carved on them (all but one had 8 crosses). They were all terribly excited by what they had seen, but the boat-shaped object was no where in sight. As they continued to walk, they showed Ron and the boys a very ancient grave-yard which had strange "monuments" in it which looked like simple representations of a 3 story boat. Were these things connected to Noah's Ark? Ron believed they were. So, he photographed and filmed everything with his 8mm movie camera (no video cameras back then) and they decided to head back to the hotel for the night. The next morning, they returned to the 2nd pile of rocks and began to walk perpendicular to the road again. This pile wasn't too far from the first and they soon found themselves looking at the walls of a very, very old stone house whose floor seemed to be set about 4 feet into the ground. The roof was gone and it was apparent that no one had lived here for a great number of years. Radiating out from the house was a very large pattern of stone fences which seemed to go on for miles. These, too, seemed to be covered by several feet of dirt with only their top few feet extending above the earth. But the most interesting feature of this site was what was in the front yard— there were 2 large stones, one setting upright and one lying flat on the ground. Carved on these stones were a most exciting picture. across the top of each was an arc-shape; below this was a curly-cue which looked like an ocean wave, and atop it was a very simple boat-shape; walking away from this boat and wave, were 8 people— the first and the largest was a man; next and second largest was a woman; the next 3 were all the same size and all smaller than the largest woman, and they were men; and the last 3 and the smallest, were 3 women. It seemed quite obvious to Ron that these were iconographic representations of the 8 survivors of the flood, all walking away from the ship with a rainbow overhead. But what did it all mean? When he studied these 2 large monuments more closely, he noted that on the one lying on the ground, the largest woman (the one representing Noah's wife) had her eyes closed and her head tilted downward. On the larger one which was still standing, he saw that BOTH the first woman, AND the first man (Noah) had their eyes closed and heads tilted downward. Since these were in front of the house, he believed they were the actual tombstones of Noah and his wife. The iconography showed that FIRST his wife died, and on her stone, only HER eyes were closed. When Noah died, BOTH of them were represented as dead. What Ron and the boys had found these first 2 days were extremely important, Ron felt. While they didn't prove anything about the boat-shaped object, they were clear indications that a family of 8 people had lived in this exact area at some very remote time in antiquity. The 8-cross design on the anchor stones showed that someone during the Christian era had identified these huge rocks with the ark and its 8 passengers. The Fences - Evidence of Noah's "Husbandry"
The ancient house— was it Noah's? They only had one morning to examine everything pertaining to the house, but the thick walls and the vast pattern of stone fences was pretty compelling evidence. The Bible gives reference to Noah being a husbandman. GEN 9:20; And NOAH BEGAN TO BE AN HUSBAND , and he planted a vineyard: 21; "And he drank of the wine, and was drunken; and he was uncovered within his tent:" 22; "And Ham, the father of Canaan, saw the nakedness of his father, and told his two brethren without:" 23; "And Shem and Japheth took a garment, and laid it upon both their shoulders, and went backward, and covered the nakedness of their father; and their faces were backward, and they saw not their father's nakedness. This passage tells that Noah was in a tent, not a house such as Ron had found. But Ron learned that the inhabitants of this region, as in other pastoral societies, still live in tents in the summer and in thick stoned houses in the winter. This seems perfectly consistent with the mention of a vineyard, which would have yielded its fruits in the warmer season. "Husbandry" is defined as "farming, as of livestock" (Random House Dictionary). After the flood, it makes perfect sense that Noah bred the animals and cared for them until the point in time that their numbers were sufficient enough to eliminate the likelihood of their becoming extinct. With only 2 of each unclean animal, if even one should not survive, that animal would become extinct. The extremely large pattern of stone fences radiating out from the house, and extending on for a good distance seemed consistent with this type of activity. The depth below the present ground level of the house and fences shows their great antiquity. Over the years, windblown dust and dirt raised the ground level, thus burying or partially burying ancient surface structures. In the above Scripture, we also included the entire passage which tells about Noah's getting drunk and having his "nakedness" seen by Ham. We included this because of one tiny point: The pictographs on the "tomb-stones" in front of the house show the men wearing a type of tunic. This is entirely consistent with Noah's nakedness being seen when he got drunk. If he had had on pants or slacks like men wear today, he would have remained covered, no matter how he "sprawled out" in his drunkenness. But with a tunic (like a dress), this would not be the case. The house is located in an incredibly beautiful plain which runs east/west. To the north and south are mountains. Unlike our country, everything is rock in this region. And especially in this isolated area, except for the village where the anchor stones were located, all that could be seen were rocks, rocks and more rocks. But when Ron and the boys looked behind the house to the north, they saw a very beautiful mountain ridge— directly behind the house. This ridge had 2 small hills which met and formed a valley in between them on the side of this ridge. And right in the middle of this Mountainside valley, Ron saw a VERY large squarish rock which looked as if it had been purposely set in its location. Behind this large rock, the valley formed a natural amphitheater. On the side of this very large rock was a complex of small fenced-in areas. If this was really Noah's house, this certainly looked like a very large altar with room for a large number of people to sit behind it as the sacrifices were made. GEN 8.20, "And Noah builded an altar unto the LORD, and took of every clean beast, and of every clean fowl, and offered burnt offerings on the altar". The altar itself measures 12' x 12' x 12' and it has one step— when we stood upon it, it was obvious that whoever stood upon this altar was quite a bit taller than we are, for the step is about 3 feet high. The complex of pens adjacent to the altar also indicates that whoever arranged the rocks in this pattern was very, very strong, because today many of the large rocks could not possibly be moved by humans without mechanical assistance. At one point, a very large boulder is balanced upon several upright stones, forming a covered area that a 6 foot tall man can walk under without stooping. Also in this complex are 2 very large stones which display features which indicate that they were used for the slaughter and bleeding of animals (Gen. 9:4). One is consistent with the size of smaller animals like sheep and goats; the other, much larger, is consistent with the size of larger animals, such as bullocks. They both have a series of chiseled-out indention’s leading from the ground to the flattened, slightly angled top. These "indention’s" are the size that is consistent with animal hooves— perhaps the animals were led up the side of these rocks to the tops, which also contain chiseled out basins with drains, which are consistent with areas for bleeding the animals prior to offering them on the large altar stone. According to the Biblical account, specific parts of the animal were offered as sacrifice, then other parts were cooked and eaten "before the Lord". (See Leviticus, chapters 1-9). DAY 3 - the "Boat-Shaped Object"
Ron filmed and photographed everything. There is actually much more than we have listed here, but these are the most important items. At the end of day 2, they had seen more than enough to make the trip worthwhile. The next day would be their last. Arising the next morning, the boys were tired and stayed in the room. They had traversed across a great number of miles in the previous 2 days and Ron knew they needed a break. So he got a taxi and returned to the first pile of rocks. They had worked their way backwards from the third pile to the first. And this one was quite a distance from the others. This time, Ron had the taxi drive as far as he could go in the direction that was perpendicular to this rock-pile. They traveled up into the mountain range to the south, as far as there was a dirt road. When it ended, Ron began to walk. With mountains everywhere, he wondered if he would ever be able to spot the boat-shaped object if he looked right at it, but soon, he saw it. And what he saw convinced him more than ever that this object was the remains of a ship. But, what he saw also convinced him that there was only one way to explore its true nature, and that was by an excavation to remove the soil which covered it. He returned to the room and they packed. He checked out that night so they could leave early in the morning, but that proved to be a big mistake. In 1977, there weren't any tourists to speak of in this region. It is desolate and very foreboding. The Kurdish villagers had been watching Ron and the boys, waiting to make their move. As long as they were staying in the hotel, they were spending money, paying taxis and guides. But these bandits wanted it all, and as soon as they realized they were about to leave, they attacked. It's a long story, but to summarize it, Ron and the boys heard them coming up the steps banging pipes and making a lot of noise. Shoving the furniture in front of the door, they tied the bed sheets together and climbed out their 3rd story window onto a roof below. There, they climbed back into the 2nd floor window which led into the kitchen, and they ran through the hotel and out the door. In the commotion, they lost almost all of their film. Ron did manage to hang on to some of the movie film. Once they were safely out of town, they realized how truly dangerous the region was. The boys would never go there again, and after all they went through, they would never see the "boat shaped object" in person. Back at Home - Now What? Ron had gone to Turkey for one reason—his own personal curiosity. What he saw, fueled his resolve to investigate the site more thoroughly, but as a private individual, he had no idea where to start. He knew the site needed to be excavated, but how could someone like himself get permission to do so? And how could he interest important scholars and archaeologists in the site, when most people believed that if the ark existed at all, it had to be on Mt. Ararat? In 1978, someone told Ron about another man who was interested in the boat-shaped object—a man who is an MD and an archaeologist. This man is Dr. Bill Shea of the Biblical Research Institute in Silver Spring, MD. In November of 1978, Ron finally made contact with Dr. Shea, who had written an article about the site in Sept. 1976. He believed that the site should be thoroughly investigated, and when comparing the boat-shaped object to the current thought that the ark HAD to have landed on Mt. Ararat, wrote: "To conclude, one might put these two sites in perspective by rejecting upon what would have happened had this formation been found on Agri Dagh lMt. Ararat]. I may be wrong, but I suspect that news of it [the boat shaped formation] probably would have been heralded far and wide as the discovery of the site where the Ark had rested. What a difference a mountain makes. CREATION RESEARCH SOCIETY QUARTERLY, Vol. 13, Sept. 1976, "The Ark-Shaped Formation in the Tendurek Mountains of Eastern Turkey," by Dr. William H. Sea. Dr. Shea also mentioned that he too believed that the Royal Egyptian Cubit was used in giving the measurements of the ark: "Assuming a Mosaic authorship for these measurements probably would indicate that they were given in terms of the Egyptian cubit of 20.6 inches rather than the shorter Mesopotamian cubit." After Ron and Dr. Shea communicated and Ron shared his information from the Aug. 1977 trip with him, Dr. Shea began to apply for permission to excavate. The reply was negative. As far as Ran was concerned, there was nothing else he could do. So he waited, for what, he didn't know. In 1978, Ron decided not to return to Turkey—instead, he and the boys went to Egypt to research the Red Sea crossing site. Perhaps Dr. Shea could one day get the permission they so desperately wanted. But then, in late December 1978, Ron heard a news report of an earthquake in eastern Turkey. He still remembers how his heart began to pound—HE couldn't excavate, but perhaps "nature's" God had done what he couldn't! He had to patiently bide his time until his next 2 week vacation came in August. And on August 11, 1979, he arrived the second time in Istanbul and headed for the site. This time, the boys didn't go. Ron wasn't going to take any more chances with his young sons safety, but he did take an Armenian preacher from California who spoke Turkish. When they arrived at the site, Ron just wasn't prepared for the spectacular sight his eyes beheld— the earthquake (which injured no one) had dropped the earth around the object and there on the Mountainside Ron saw what looked like a giant shipwreck! Evenly spaced indentations could be seen all the way around the object, which looked like decaying rib timbers. The earthquake had also cracked the object from "stem to stern" and Ron was able to take samples from deep within. He also took samples of material outside of the object for comparison. He measured the object and got a 512 foot length—but, he saw what looked like a section about 1 yard long that was broken off from the lower end. This was positive evidence in Ron's eyes: 300 Royal Egyptian cubits were 515 feet— this object was 512 feet with a 3 foot section broken off of the lower end—a total of 515 FEET! He again visited the anchor stones and the graveyard which had the strange monuments which Ron believed were representative of the Ark and its 8 passengers. It was a short trip, but Ron had gotten accomplished more than he had hoped for. The next step was to have the samples analyzed. He had to get back home and return to work immediately, so it was October before he managed to get the samples to Galbraith Laboratory in Knoxville, Tennessee. This sort of testing was and still is expensive, so he only had each sample tested for a basic mineral analysis. But that was enough for a start— the sample outside the formation showed a 1.88% carbon content; but the one from inside the crack yielded a 4.95% carbon content, an amount that was consistent with the presence of prior living matter, such as decayed or petrified wood. It also showed a surprisingly high iron content. It was another positive evidence— but again, Ron found himself at a standstill. What next? Applications to excavate were still made, but each time with negative results. Ron was in for an even longer wait this time. But in the meantime, Ron decided to make all the information available to others. Looking back, the evidence might not have seemed as convincing to others as Ron thought it surely would have been. After all, he had been there twice, he had seen the wonderful evidences which spoke of 8 survivors of the ark from that very region. But when he wrote it all up in a booklet called "Noah's Ark Found," not everyone accepted the evidences as overwhelming. Ron told the story of his two trips to Turkey, what he saw, filmed and photographed, and he gave the lab analyses and told about the tombstones he believed marked the sites of Noah and his wife’s graves. He explained about the Royal Egyptian Cubit, which, considering the length of the boat shaped-object, he felt was overwhelming evidence. He gave these to anyone who was interested, hoping to gain interest and support from others who might want to help. But the fact of the matter was that this wasn't enough. In fact, this little booklet would one day be responsible for the theft and destruction of one of the most incredible evidences— but it was a lesson Ron would have to learn the hard way. Meanwhile, he had no real idea what he could do to further his research. Since all his investigation would have to be non-destructive, Ron decided to check into the possibility of getting a metal detector to check for the possibility of evenly spaced metal readings. He called White's Electronics in Sweet Home, Oregon and shared with them his project. They listened to his proposal and found it to be a worthy and legitimate research project, and shipped him their top 2 model metal detectors, which Ron hoped to be able to use on the site. In 1983, he read an article about Col. James Irwin, the Apollo 15 astronaut, and how he was actively involved in searching for the ark on Mt. Ararat. Ron called him and shared with him the information he had on the boat-shaped object. Col. Irwin was extremely gracious, and said he was interested. so, Ron drove out to Colorado and met with Jim at his office. Jim was interested in seeing the site, and offered Ron any help he could give him. Jim was taking an expedition to climb Mt. Ararat in August of 1984, so he and Ron decided to travel together so that Ron could show him the site. They arrived in Istanbul on August 19, 1984 and proceeded to Ankara. In Ankara, Jim met with Kasim Gulek and his wife. Dr. Gulek is the only man still alive who served as a cabinet member in Ataturk's government, and he is a very influential man. Ron accompanied Jim to their home and this proved to be a very valuable meeting. Here, Ron met several people who would soon become very important to Ron's work: Orhan Baser and Mine Unler, both who would become governmental liaisons between Ron and the Turkish government. Ron was essentially no one of importance, and would have had a difficult time meeting these people on his own. But through Jim's kind help, Ron's efforts were about to really make an impact. They spent the night at the Guleks and the next day, they went to Dogubeyazit. Ron took Jim and several members of his group to the boat shaped object. At that time, he employed the metal detectors on the site. Orhan Baser had secured permission for him to do so. Jim was present when Ron and other members of the group used the 2 metal detectors along the sides and atop the entire length of the boat-shaped object. The results were a pattern of linear readings which showed an organized grid of metal within the object. Along the sides, they got readings every 9 feet. It was completely outside of the realm of possibility for this pattern to be natural. In a video-taped interview with Ron, Jim stated: "Yeah, we got some real positive readings, didn't we, as we went up and down the long direction of the formation .... The spacing made it appear like, very much like it was, you know, a man-made object." Jim wasn't convinced it was the ark, but he knew it had to be something. He was dedicated to searching on Mt. Ararat, and he and Ron agreed that this was an absolutely necessary part of the whole picture. If the boat shaped object WAS the Ark, there were many who wouldn't accept it until the possibility of it being on Mt. Ararat had been ruled out. There was no "competition" between Ron and Jim, although there are those who would like you to believe there was. Jim was one person that Ron felt he could trust— a gentleman and a man of his word. And he helped Ron immensely. After Ron and Jim visited the site and did the first metal detector scans, the word spread among the other "ark-hunters" who had gathered in the hotel lobby, and when they returned, another group expressed the desire to visit it, too. This was a group headed by Marv Steffins and included Bulant Atalay and their helicopter pilot, "Whatcha" McCullum. Ron went with them after lunch and they were thrilled to death when they saw the results of the metal detector scans. It seemed as if Ron had found some allies, but it didn't quite turn out that way. It was also at this time that another well-known "ark-hunter" with very impressive letters after his name, heard about all the interest in the boat shaped object while in the hotel lobby. Ron told all the other ark hunters about the equipment White's Electronics had provided him and offered its use to any present— perhaps a naive thing to do, but nonetheless, its what he did. At that point, this well-known ark-hunter stood up and in a VERY loud voice told Ron, "YOU CAN'T USE METAL DETECTORS IN TURKEY! ", a ploy obviously designed to have the metal detectors confiscated by local authorities. And while this isn't something I'm happy to write about, it happened. Ron took this man by the collar and told him in no uncertain terms that if he did not keep his mouth shut, he would knock his teeth out. The man only replied to Ron, "YOU'RE CRAZY!" to which Ron then replied, 'I'M NOT CRAZY ENOUGH TO LET YOU DO WHAT YOU'RE TRYING TO DO." Ron, as well as the ark-hunter, both knew that even with permission from Ankara, the locals could still confiscate the equipment, and by the time Ron was able to get back in touch with Ankara, it would be too late to use it. It was an unpleasant and unfortunate thing to happen, but it did—and the man never said another word about it. In fact, he even asked to go to the site, which Ron thought was strange since this fellow had already stated that he had "investigated" the site thoroughly on 2 occasions. There was no more trouble from him that trip, but this man let it be known that he would do anything from that time on to discredit the site—and that is exactly what he has tried to do. Ron took numerous samples of material from the site as his liaison, Orhan Baser had secured permission for him to do so. Ron wasn't going to jeopardize anything by not getting the proper permission. Marv Steffins did the same, only without securing permission. Later that trip, Ron and Orhan decided to scour the region above the boat shaped object for any other evidences that the Ark was known to be in the region. Quite a ways up the Mountainside, Ron and Orhan came to a site which contained the remains of a very ancient stone building. Since nothing else was around, it appeared to be perhaps a traveler’s station or something of that type. Close by, Ron found something VERY interesting. It was a section of earth that Ron measured to be 120 feet by 40 feet, which was rimmed by what appeared to be petrified wood, and within its perimeter was a massive amount of strange looking "rock". This "rock" was quite heavy and tinged green in places, and therefore Ron believed it to be some type of metal. He had an idea as to what the wood perimeter was, but perhaps a lab analysis of the "rock" material would help confirm his idea. Since the boat-shaped object is located in a mudflow which contains remnants of volcanic rock, Ron believed this mud-flow was actually a deteriorated lava flow. The boat shaped object looked exactly like a ship wreck, but it was impaled on a very large outcropping of limestone directly through from the western side to its mid-section. To Ron, it looked as if the ship had been transported down the Mountainside by the lava flow (which covered the ship) and, sliding sideways, it hit this large outcropping of limestone which caused it to be "racked," exactly like a car that it literally wrapped around a telephone pole. Ron suspected that the 120 X 40 foot section above the site was actually a portion of the bottom of the ship which had sunk into the mud as the flood waters subsided. 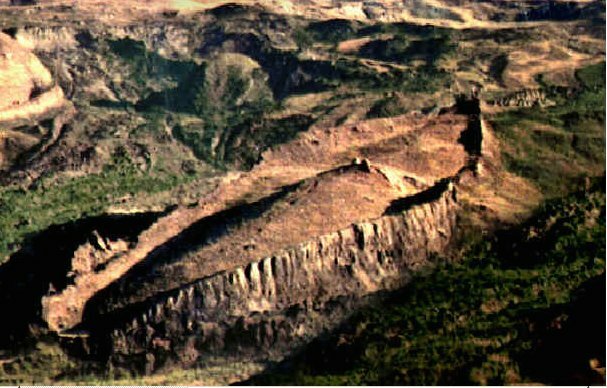 When the earth was dried, this section was firmly embedded in the ground, and as the ark was swept down the Mountainside, this portion was ripped away. The strange looking "rock" he found within this perimeter was very similar in appearance to "rock" he found just below the lower section of the ship—the broken off section. He theorized that this was ballast material placed in the hull of the Ark, and when the portion of the bottom was ripped off, a large amount of ballast fell out. Other ballast which remained in the intact portion of the ark was now falling out from the broken off lower section, Ron and Orhan kept this information to themselves. As they proceeded up the Mountainside to the top of the ridge near the Iranian border, they found the broken remains of an ancient stele which was being used in a more recent structure. The broken pieces were quite large and most were exposed which allowed Ron to photograph them for later piecing together. This stele contained numerous inscriptions in what looked like 3 different forms of writing. One segment of it was particularly legible. This was a scene depicting the unique ridge just above the site, a mountain peak in the background, a ship with 8 faces in it, and 2 ravens (one flying above the ship and one above the mountain). The rest of the inscription featured several animals. But the importance of the stele was that the shape of the boat was almost identical to the 1950s aerial photo of the boat-shaped object. The 8 faces within the boat needed little explanation. But most importantly, this stele was just beyond the site where Ron had found the 120 x 40 foot section he believed to be a portion of the bottom of the ship. He would study the inscription more later, but for now, it appeared to him that it was marking the location of the original landfall of the ark. It was this trip when Ron brought numerous copies of the little booklet he had published in 1980, "Noah's Ark Found," and handed them out to all those interested in the site. Within a few months, he would regret having done this. Finally, it was time to leave. Ron got on his flight in Istanbul and headed to Athens, Greece, where he was to pick up his international flight to the U.S.. But a strange series of events was about to take place. As he was waiting in the airport, he got a New York Times Newspaper and read an article that nearly knocked him off his feet. He had been accused of taking artifacts illegally out of Turkey! The story told how Marv Steffins (who had promised to keep a low profile about the site) had gone to Ankara, produced some "wood," called a news conference and proclaimed that Noah's Ark had been found! Since he had not obtained permission to take any samples, his were confiscated, and he told the authorities that Ron Wyatt had also taken illegal samples. In the years since 1978, Ron and the boys had been working in Egypt and Israel. When they found the chariot parts in the Red Sea, they then knew that Mt. Sinai was across the Gulf of Aqaba in Saudi Arabia. For over 4 years, Ron had been trying to get a visa into Saudi, but when it seemed impossible, he and the boys decided to enter illegally. Before he left on that trip in December of 1983, he told 2 people what they planned to do. One of those people was Jim Irwin. The other was an "ark-hunter". Soon after they arrived at Jebel el Lawz, they were imprisoned for 78 days, accused of being Israeli spies, and didn't arrive back in the U.S. until April 18, 1984. Ron was becoming acutely aware that his archaeological work was not without danger. But it was becoming VERY apparent that the danger was from those who he thought were friends. It was an "ark-hunter" who called the Saudis and told them the Wyatts were Israeli spies. It was an "ark-hunter" who told the Turkish authorities that Ron had taken illegal artifacts out of the country. But in both cases, the end result would be that each site was taken VERY seriously by its own government. It was a long ride home for Ron. He knew that the penalties for taking artifacts were stiff, and he knew that all he could do when he arrived in New York was turn himself in. So, when he arrived, his first call was to the Turkish Consulate. He explained the situation—that Orhan Baser had obtained permission for him to take the samples—and he offered to turn them over to the Turkish authorities. That afternoon, 3 men from the Consulate came to Ron's hotel room, examined the specimens, and then told him to keep them. They had checked out Ron's story and found that he was telling the truth. But Ted Koppel didn't know that, and accused Ron on Nightline of being a thief. It was not a pleasant situation. Ron called his own news conference and told his story. The Turkish government issued a statement clearing him of all charges, however, Ted Koppel neglected to mention this on a later broadcast. But all turned out for good. A reporter from the United Nations Observer and International Report did an article on Ron and his work on the site, which was published in the January 1985 issue. Until this time, Ron had no allies other than Dr. Shea. He hoped that now, help would be forthcoming. But the Marv Steffins incident proved to be the mold for the future pattern. Mr. Steffins told the press HE had discovered Noah's Ark. No mention of Ron's efforts were ever made other than the fact that Ron had taken "illegal artifacts". But back in Turkey, all the "bad press" combined with the positive results of Ron's investigations had led to the Turks taking a serious interest in the site. This time, Ron had been able to get a good selection of specimens. And again, he went to Galbraith for the analyses. This time, the results were spectacular. One specimen that Ron believed to be the remains of a metal fitting of some type, proved to contain 8.08% iron, 11.55% ferric oxide, 11.45% alumna and 6.06% aluminum. Ron sent some samples to Jim Irwin who had offered to send them to a laboratory he worked with for analysis. One of those specimens was of the strange "rock" Ron had obtained from the 120 x 40 foot area above the ark's present site. Jim sent some of the specimens to Los Alamos National Laboratories, the very high-profile government facility in New Mexico. Meanwhile, Turkey had appointed their own scientists to take a look at the site. Ron returned 2 months later, in October, and this time took an acquaintance who was an artist. He made contact with one of the liaisons he had met on the last trip, Mine Unler, who arranged for him to obtain proper permission to again use the metal detectors. He took more samples (with permission, of course) before leaving, and loaned one of the metal detectors to the scientists appointed by the Turkish government to check out the site. After the "Marv Steffins incident," an official with the Ministry of Culture and Tourism, Mr. Kafji (not sure of spelling) appointed several Turkish scientists to go to Dogubeyazit and check out the boat-shaped object. When Ron became aware of this, he felt it was imperative that they have the use of a high tech metal detector so that they could check the metal readings for themselves. He arranged to loan them one of his White Metal Detectors. He later learned that they had indeed gotten the same results and were convinced that this was a fossilized boat. Finally, PROGRESS! Returning home, Ron again had analyses run on his samples. This time he had brought a sample of what he believed was the ballast material. This analysis showed that the material wasn't just a rock—in fact, it proved to be 84.14% manganese dioxide. But, it didn't contain the other minerals present in the other samples which was very significant, since it came from the same location. Ron believed that a ship the size and proportions of Noah's Ark would have HAD to have had ballast in its hull. And this strange "rock" was heavy and in large chunks, perfect for use as ballast. But what exactly was it? It gave the superficial appearance of being tailings (waste product) of some type of metal production. When a chemist with Reynolds Aluminum examined the specimen, he said without qualification that it WAS metal production tailings. The lab analysis confirmed that it could not be something natural. One "ark-hunter" in attempting to explain away the evidences, attacks these "rocks" by claiming that they are nothing more than what are called "manganese nodules," which are found on the sea-floor in the Pacific. However, they do NOT meet the criteria of these nodules. According to common scientific knowledge, the manganese nodules found on the ocean floor are known to average about 2 inches in diameter, significantly smaller than these massive "chunks" of ballast material, some of which are 10 inches or more in size. In addition, the nodules found on the ocean floor average containing 35% manganese, with 50% being considered the highest percentage amount of manganese. The ballast material contains over 84%!!! Also, the manganese nodules on the sea floor contain nickel and cobalt, which is not found in the ballast material, which was thoroughly tested for mineral content. No, there is no doubt that these specimens are not naturally occurring. Many people accused Ron of having too vivid an imagination—they claimed that he just "imagined" that these evidences were actually present. But as time would pass, the reality of the evidences would soon necessitate that these folks come up with much better "excuses," because the facts would soon attract more "higher academic interest," as Tom Jerrell would one day state on "20/20." He had been able to get more specimens that he believed were from metal structures, and again took control samples for comparison. This time 3 of the samples he thought were metal showed high metal content 19.97%, 12.30% and 11.55% Ferric oxide; 8.08%, 13.97% and 8.60% iron. Yet, the control samples showed .77% ferric oxide and .54% iron. If Noah had built a ship of the size specified in the Bible, it made perfect sense to expect that he used metal in attaching the timbers together. After all, in Genesis, we learn that metal production was a science long before the time of the flood: GEN 4.22; "And Zillah, she also bare Tubalcain, an instructor of every artificer in brass and iron: and the sister of Tubalcain was Naamah. A Big Problem for the "Experts"
With all of the evidence thus far, the '"ark-hunters" who had dedicated their efforts to finding the ark ON Mt. Ararat were getting very frustrated and peeved with the attention given the site on what is called locally, "Doomsday Mountain". It was time for "damage control," to try and discredit the site as much as possible. And, if they couldn't discredit the site, they would discredit the man. Ron became very unpopular. Dr. Bill Shea had already noted that, in his opinion, if the "ark-shaped object" had been found on Mt. Ararat, he felt sure that it "would have been heralded far and wide as the discovery of the site where the Ark had rested." But since Mt. Ararat was the highest mountain in the region, the so-called experts had already determined that THAT was the only place the ark was to be found. Yet, the Bible is so clear in the fact that it came to rest in the "mountains" of Ararat. GEN 8:4; "And the ark rested in the seventh month, on the seventeenth day of the month, upon the mountains of Ararat." The next verse goes on to state that even after the ark had come to rest, the tops (plural) of the mountains couldn't yet be seen until almost 3 months later. Remember, Ron's experiment with the miniature mountain configurations in a stream with a small boat model? The little boat simple zipped past a solitary peak extending out of the water, but when it approached a crescent shaped configuration, the hydraulic action of the water eddy formed within this, caused the little boat to be sucked into the space within the crescent shape. 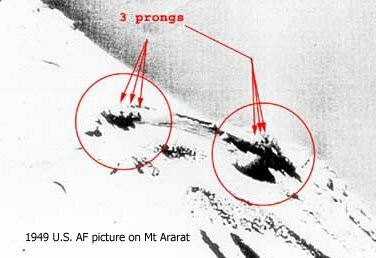 If, at the time the ark "rested" in the "mountains of Ararat," the tops were not even visible, the only explanation he could visualize was that it came to rest within a group of mountains that formed a similar crescent shape—even though they were underwater, the water action still drew the ship into such a protected area. And this is an entirely reasonable concept. We are all probably familiar somewhat with the dangers of rip tides and other water currents caused by underwater terrain which definitely affects the water action on the surface. The present location of the site fits this description perfectly. It was located at 6,300 feet above sea level in a mountain valley surrounded by higher mountains on 3 sides. But his efforts were beginning to pay off. Turkey was now taking an official interest in the site. Meanwhile, the "Ararat ark-hunters" got busy working on stories that would place a large lake in the region of the "boat-shaped object," or digging up "myths" that people in antiquity built either a large ship in the region, or a replica of the ark. It's strange how these stories never surfaced until this time. In time, a story would be fabricated that this site was actually the remains of an ancient fortress—a fortress built at the foot of a mountain valley with hills surrounding it on 3 sides which would have allowed attackers to simply fire down upon the hapless inhabitants of the fortress like sitting ducks. We still laugh about that one. Others who had more impressive "credentials" were satisfied to state simply that they had "examined" the site thoroughly and found that it was simply an unusual geologic formation. Some have stated that this was only one of many "boat-shaped" objects in the area, and insisted that it was only a "obstructed flow formation. However, in "obstructed flow" formations the pointed end always "down-flow," or at the low end—the complete opposite of this site. But to Ron, the bottom line was always this—if this site did indeed contain the remains of the ark as he believed, God was certainly capable of making it known. With that thought in mind, Ron was at peace. If the God of Abraham, Isaac and Jacob was the TRUE GOD, and if He had created the universe and destroyed the old earth by a flood, then He was certainly capable of preserving enough evidence to prove whatever it was He wanted to prove. But would He provide enough evidence to convince the entire world? Well, even those who saw Christ perform miracles with their own eyes, crucified Him. Some people will never believe "even if one came back from the dead". Ron's original purpose in coming to Turkey was now accomplished—he came, not to make a great discovery, but to satisfy his own curiosity. He was personally completely sure that this was the remains of the ark. But now he felt compelled to "hang in there" and continue work on the site, even with its tremendous financial drains—after all, if God had preserved the ancient vessel, it had to be for a reason, and it was certainly for the benefit of more than just Ron Wyatt. To some, it would seem as if Ron had become obsessed. But to Ron, this was of such incredible importance that nothing else seemed very important anymore. He believed with every iota of his being that this was Noah's Ark. If he didn't gather the evidence for all those people who had been taught that the Bible was full of fables and myths, who would? His reasoning was simple—he believed the Bible was absolutely factual, and as such, the only real importance we as individuals have during our short existence in this present life, is what we do for the Creator Who gave us that life. And what He wants us to do is also quite simple: obey His Commandments and spread His Truth to others. There were and are many, many people dedicated to spreading His Word to those who never had an opportunity to learn about Him. But what about those who had heard and rejected His Truth because they had been taught that the Bible was fiction? What about those who had been taught as FACT the THEORIES of the evolutionists that now dominate our lives in all areas? We live in a time that is fraught with dangers everywhere we turn, even in our churches. And Ron knew what his decision was—he would continue the work, no matter what. He knew he would be up against, both "Christian evolutionists," and the secular evolutionary camps, but even if one person benefited from his efforts, that would make it worth it. Even some of those who claim to champion the cause of "creationism" state that the earth is "about 10,000 years old—yet, the Biblical account tells us it is less than 6,000. If we can't believe ALL of the Bible exactly as it is, what DO we believe? These comments may sound harsh—this is not our intent. We are most aware that all of us are what we are and believe what we believe because of where we were born and what we have been taught. The only hope for those of us who were taught wrong concepts is that we be willing to investigate and discard the wrong and accept the right. After seeing the boat-shaped object and being present when the first metal detector scans were done, Col. Irwin agreed that the site needed to be thoroughly investigated. And although he was dedicated to completely searching Mt. Ararat, he was always helpful to Ron if there was anything he could do. Since he is deceased, I want to be sure and stress that he never said he believed the site was the ark, he did say that he found the site "intriguing," and that before he made any conclusions, he wanted more scientific evidence. He died before Ron could supply him with the accumulated evidences. But unlike others who would come along later, he never tried to sabotage the research—in fact, he was willing to do whatever he could to help Ron. And so, when Jim got a call from a man who was interested in searching for the ark in a different location than Mt. Ararat, he referred the man to Ron. This man had called Jim with the idea of searching for the ark in the lava flows at the foot of Mt. Ararat. He didn't believe the ark could have possibly landed on Mt. Ararat and survived a volcanic mountain. If it survived at all, he believed it would not be on the mountain. He wanted to search in the lava flows with the relatively new "sub-surface interface radar," a ground penetrating radar system which could show objects beneath the earth's surface. Jim gave this man Ron's phone number. And so, David Fasold called Ron. Ron told him about the boat-shaped object and all the research that had been done to the present time. David was very excited and wanted to go as soon as possible. Of course, so did Ron. When he had told David about the metal detector scan results, Dave mentioned that he had a new type of metal detector that was capable of discerning types of metal, which would be very useful. He also told Ron about the "sub-surface interface radar" which would reveal the remains below the surface. Dave was a former merchant marine, a marine salvager and treasure hunter. He kept up with the latest technology and was just what the research needed at this time. His excitement and enthusiasm were just what Ron needed, and they were about to embark on some serious research. Plans were made—and on March 20, 1985, Ron and Dave arrived in Istanbul, where we will begin PART 2 next issue. Who Decides if It is the ARK? What do real archaeologists say about this?—do they think its the ark? Well, there's no better answer than the one Richard Rives gives: "Leading archaeologists and scientists say that the earth is millions of years old and that you and I descended from a monkey. It is our policy to ONLY ask experts in the various fields to state facts about the evidence, such as the fact that there is organic carbon in the specimens from the ark in an amount consistent with the presence of once living matter, such as decayed wood. We don't ask anyone to say this is Noah's Ark. There comes a time when people have to learn to think for themselves. We've become lazy—we want to be told what to think; we want someone to lay it all out for us. Life gets comfortable—if we learn that Noah's Ark really existed, we may have to adjust some of our other thinking and that may not be a real pleasant prospect. There is the great example that we should never forget—the people of Christ's time wanted a Messiah that was a regal king—a glorious leader who would give them a wonderful kingdom on earth. They wouldn't accept the Messiah that God sent to them. He didn't match their expectations or their wants. And so it is with Noah's Ark. The "learned men," like the leading religious leaders of old Jerusalem, expect and want a "glorious barge-shaped ship" high on the volcanic peak of Mt. Ararat. They won't accept the fragile remains He arranged to be preserved in the manner and location that HE chose. 'Well, if these important people say its not the ark, then it must not be." And after all, what does it really matter if the ark is really found? It matters. Something else that we must remember—there were many, many common, simple-minded people in Christ's time who accepted Him as the Messiah based on their OWN decision; based on what THEY knew to be truth. They didn't need the "learned men and religious leaders" to make their decisions for them. What kind of a God would we have if He created us with a dependence on others to make our decisions for us? Do we really believe that we must have a scientist who is trained in and ingrained in evolutionary science tell us what is truth? I hate to tell you folks, but it would be like finding a lost grain of sand in the ocean to find a scientist who would step forward and say that Noah's Ark had been found. One scientist that Ron took to the site, went on the television and said he believed this was most likely Noah's Ark—in fact, he said that he personally believed that it was. Yet, he later told Ron that the facility he worked for told him he could either work for them OR work on Noah's Ark. Today, this man is a vehement opponent of the site. Did the facts change? NO. Only his statement of opinion. This is a decision that the common folk will have to make for themselves. But what about all the fancy and complicated scientific testing—how do we understand what it all means? It's not complicated at all. Ron made his living for 4 1/2 years doing complicated chemical analyses for Hercules Powder Company. But, he has these analyses done at reputable laboratories. The results are FACT, untainted by "managed results." If the tests show evidence of decayed or petrified wood, that is FACT. If the metal detector scans show the presence of iron at regularly-spaced intervals, this is FACT. There is scientific FACT and then there is THEORY. The boat-shaped object is shaped like a ship and it is the size of the Biblical ark, as translated into Royal Egyptian cubits. This is fact. It contains metal at even intervals—this is FACT. "THEORY" is that it is an old replica of the ark, built in the time of Constantine, or that it is an old fortress. It is also "THEORY" that it is Noah's Ark. Circumstantial evidence. Like a court case, YOU decide, after sufficient evidence is presented, what it is. Just be very careful to separate the THEORY from the FACT. We believe this is Noah's Ark, and we are so convinced based on the tremendous amount of evidence that we will state our belief without hesitation. Others will state without hesitation that it is NOT the ark. It will ultimately come down to the fact of whether you believe it is within the realm of possibility for something to "look like a duck, quack like a duck, give birth to baby ducks, swim like a duck, and yet NOT BE A DUCK." A tour group, organized by Wyatt Archaeological Research, visited the site. As Ron and the group approached "Noah's Ark" from the south end, he noticed an object that when observed, in the presence of the tour participants, bore the shape of a very large "rivet" head, with a washer around it. Ron had previously photographed what looked like groupings of metal fittings on the sides of "Noah's Ark", but he could not disturb them by cleaning them off. his stripes we are healed"
even any letter from Pilate is eternally pale in comparison..
We thank our Lord for this sure authentication. Word in Scripture. Nothing else matters. Read: Muhammad, Terrorist or Prophet?